I had a great childhood. I played baseball, rode bikes with friends, played hockey on the pond and played maybe one too many video games! However, there was one common connection to everything I did – I was close to home. With all of my food allergies, summer camp was only something I heard about through movies. Although my summers were great, they were generally confined to an area that circled around a particular epicenter – my kitchen. This is why I am THRILLED to hear of places like Camp Emerson in Massachusetts. As a proclaimed “Food Allergy Specialist”, they pride themselves in providing a worry-free experience for campers and parents alike. They are peanut, tree nut, shellfish and sesame free. They have successfully supported children with up to 9 anaphylactic allergies. A team of Registered Dietitians prepare the menu with you prior to camp. Parents are able to review the menu in advance and read all labels. They have dedicated equipment and kitchen area to avoid cross-contamination. There is on-site medical staff (pediatrician, nurses) trained in allergies. The directors have food allergies and truly “get it”. I can go on, but I recommend you take a look at their brochure all about campers with allergies: http://www.campemerson.com/future_families/food_allergy_specialist. It wasn’t until college that I entered the summer camp world as a staff member at a camp in Ontario. It was an incredible experience that kept me coming back – 5 summers in total! It opened my eyes to the value of camp and the countless benefits it provides children. 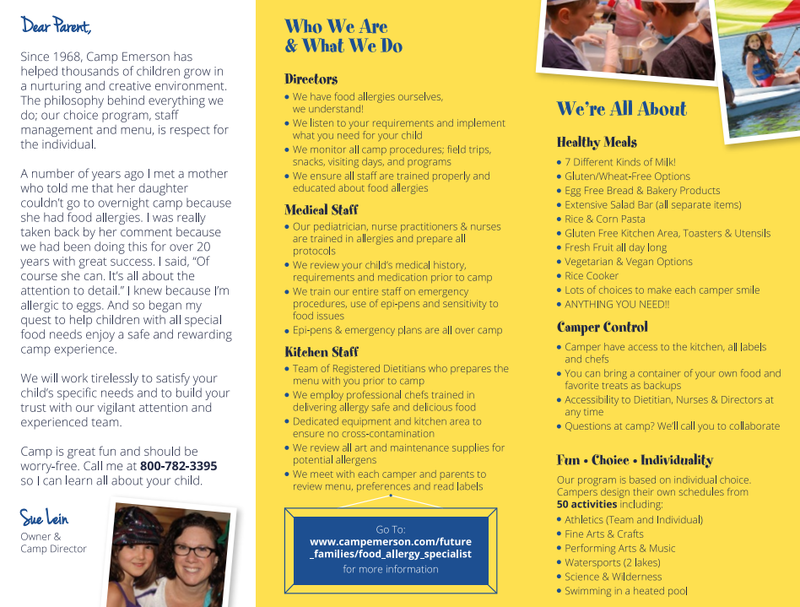 Camp Emerson has generously supported my tour and DVD as a sponsor, and I am thrilled to endorse them, as I believe they are trailblazers setting gold standards for how camps can accommodate allergic campers. They share my belief that food allergies shouldn’t be a barrier for summer camp. After missing out on summer camp as a kid, I worked at one during my summers at university. It really opened my eyes to how incredible this experience can be for kids. 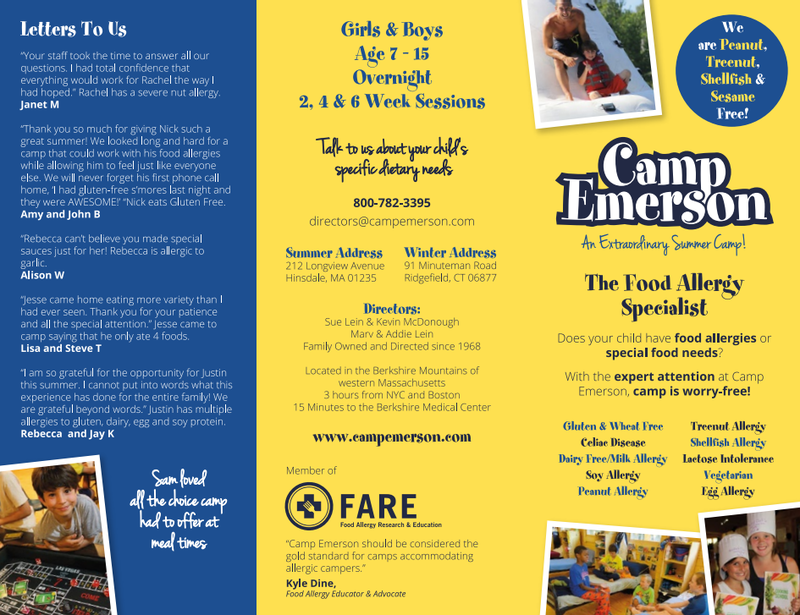 I met Sue Lein, the owner of Camp Emerson last May – a camp in Massachusetts that accommodates campers with ALL food allergies. She has an egg allergy and manages a camp that takes care of every single allergy safety detail, so kids can really focus on having FUN! They are now enrolling for summer sessions. I was really excited to see this news today as I am a frequent user of the Yodish app! See original blog post. CHARLOTTE, NC (February 18, 2014) – If you live a life free of gluten or dairy – or both – you’re next trip to Walt Disney World in Orlando, FL just got simpler. 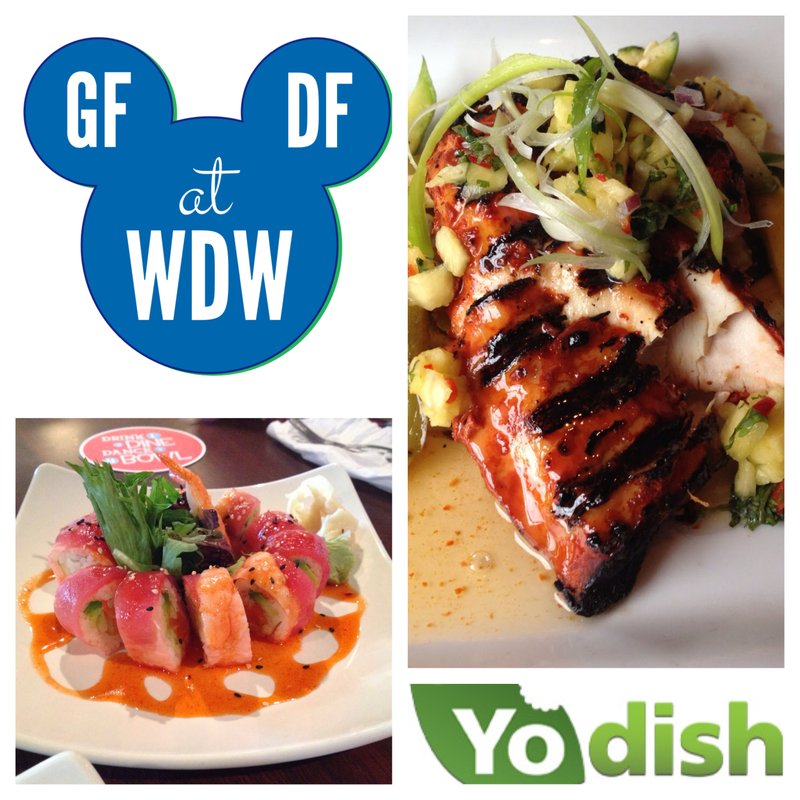 YoDish, the startup behind the free iPhone app for restricted diet dining out, has teamed up with Sarah Norris, the leading expert on gluten free, dairy free dining at Walt Disney World, to provide a long list of excellent gluten and dairy free meals across more than 50 resort restaurants. YoDish serves up Sarah’s meal photos and comments for the restaurants closest to the app user with links to Sarah’s full review of each restaurant at www.glutenfreedairyfreewdw.com. Like many Americans, Sarah fell in love with Walt Disney World at an early age. However, it wasn’t until August 2009 that she made her first special diets trip to the resorts, during which she was amazed at the level of professionalism, compassion, and pure “Disney magic”. Inspired, Sarah began blogging routinely about her dining experiences at the resorts, which she now visits on a monthly basis. Disney is widely recognized by the gluten free and food allergy communities as a leader in specialty diet accommodation, with many families facing dietary challenges choosing to vacation at Walt Disney World for this very reason. Justin Cunningham founded YoDish to provide specialty diet communities a platform for sharing dining out experiences, and he immediately recognized the opportunity for YoDish to extend the reach of Sarah’s extensive resource to a new audience looking for restaurant meals on-the-go. 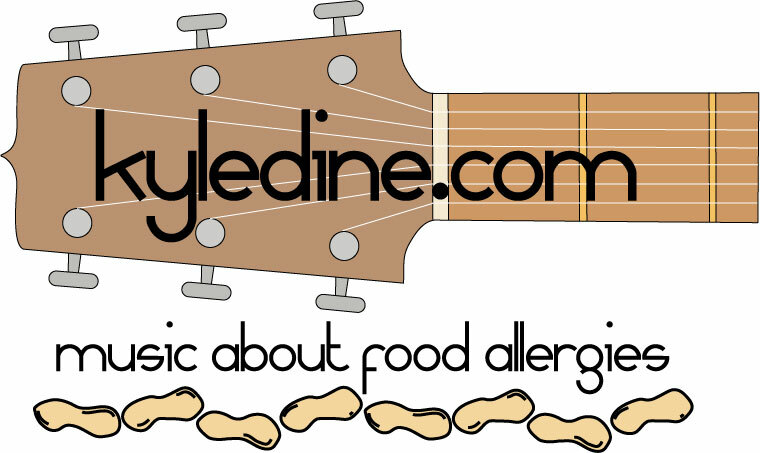 Justin and Sarah met at the first annual Food Allergy Bloggers Conference in November 2013 and began working on the joint effort soon thereafter. Sarah and Justin are now encouraging others who manage dietary restrictions to post reviews to expand the impact of the resource. Anyone with an iPhone can download the app for free, see reviews by folks with similar restrictions, and post reviews of their own dining experiences to “pay it forward”. 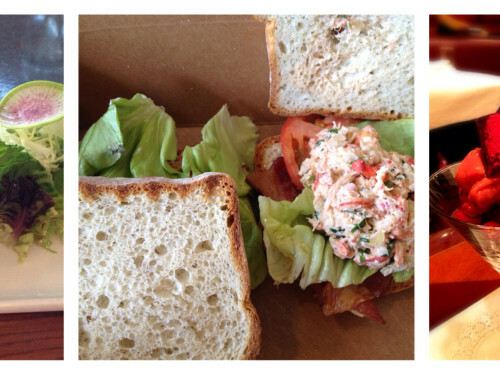 “We limit reviews to 250 characters, so it is really very quick to add a picture of your meal and a brief comment. It’s like tweeting or sharing a photo with Instagram.” “Seeing photos of real meals helps diners start the conversation with Disney’s Special Diets Department in advance of their visit or be better prepared when speaking with Disney Chefs onsite, so it is important for as many people to contribute as possible,” said Sarah. Depending on your dietary profile and geographic location, you may or may not see many dishes near you right now since YoDish is a relatively new resource. The more reviews you add in your own area, the faster the community will grow. However, you can be sure that many meals will entice you on your next gluten free, dairy free trip to Walt Disney World. YoDish, a free iPhone app, enables people with gluten intolerance and food allergies as well as vegetarians and vegans to share their restaurant dining experiences while on-the-go. YoDish is socially driven and leverages FourSquare’s global locations database to provide users an instant list of the restaurants near their current location. 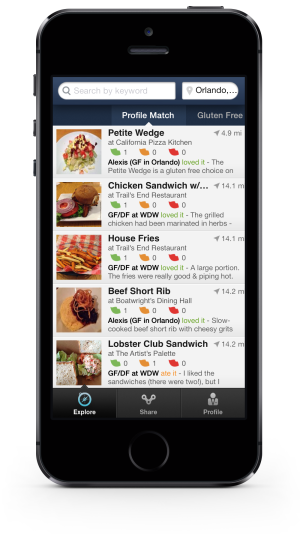 Users can post their dish reviews in the app as well as to Facebook, Twitter, and FourSquare. Justin and Emily Cunningham, whose daughter has been diagnosed with severe allergies to dairy, eggs, peanuts, and tree nuts, understand the challenges involved in eating out with dietary restrictions. Learn more about and download YoDish. Gluten Free & Dairy Free at WDW was founded by Sarah Norris in 2009 and is the top source for gluten free and dairy free dining information at the Walt Disney World Resort. Gluten Free & Dairy Free at WDW contains reviews, tips, tricks and trip planning resources to assist those visiting Disney with a special diet. In addition to resources found on the Gluten Free & Dairy Free at WDW site, those interested in special diets at Walt Disney World can also find on-the-go information through the site’s podcast, found on iTunes. If you know my music, you know that my songs are very upbeat and always carry a positive and optimistic message. This is no fluke! Studies show that children with food allergies have a higher quality of life when they maintain a positive attitude over their food allergies. When I first read one of “The No Biggie Bunch” books, I fell in love with the positive tone and and characters who are not only empowered over their allergies, but also help educate their friends. Essentially, if I were ever to write a book, it would be “The No Biggie Bunch”! The title of the gang is really fitting. Food allergies are “no biggie” once you know all the steps to stay safe. We all know that there is a long adjustment period after diagnoses, but it’s important that children begin to accept and learn to thrive with food allergies. The five “No Biggie Bunch” books can help allergic kids become more comfortable with their food allergies. The unique allergic characters, and one character who has no allergies, give kids someone to identify with – I personally like Eliot who is also allergic to eggs! The books are also great classroom resources that can teach non-allergic kids to understand allergies and how they can keep their allergic friends safe. One of the books, Everyday Cool with Food Allergies, a No Biggie Bunch collaboration with allergist Dr. Mike Pistiner, teaches kids (and grown-ups) food allergy management in a positive, friendly way. The two No Biggie Bunch creators, Heather Mehra, a mother of food allergic children, and Kerry McManama, a writer and champion of kids with food allergies, use situations and feelings unique to children with allergies which kids can identify with. There is always at least one No Biggie Bunch book in my guitar case ready to go should I ever be around a group of children for some story time before or after a concert. Team Anaphylaxis is a grassroots effort to advance the Civil Rights and fair treatment of those affected with Anaphylaxis. As parent advocates we are committed to educating the public about food allergies and anaphylaxis, a life threatening and legally recognized disability. We equip, empower and support parents with the tools and resources necessary for the successful management of this highly complex, chronic health condition. We seek to promote the fair treatment and inclusion of all individuals. We believe food free classrooms provide the Least Restrictive Environment (LRE) to ensure a Free and Appropriate Public Education (FAPE). I highly recommend that you “like” Team Anaphylaxis on Facebook. Their graphics, info-graphics and quotes are really moving, educational and provide a perspective that always makes me appreciate their insightfulness. HomeFree Treats – Safe and Delicious! I remember the first time I ever tried HomeFree cookies. I was performing at a FARE walk in Boston and was roaming around meeting some of the vendors. I met Jill Robbins, a mother of a child with food allergies and the founder of HomeFree and had a great conversation with her. I remember being so impressed with her company’s dedication to making snacks that were not only delicious, but were safe for families dealing with food allergies. I then tried one of their cookies. The chocolate chip cookie to be exact. I was blown away and may or may not have asked for seconds… 🙂 Nowadays, when I depart for my road trips, I always treat myself with Home Free cookies as my safe snack on the road. I truly get excited when I see a new flavour available! They are healthy – whole grain, all natural, Non-GMO Verified, and they available in US and Canada. In Canada they are in Target and in a growing number of natural food stores. I crossed paths with Jill on several occasions over the years and started to notice one thing about her. She truly listens to my music. More than that, it seems she listens to every word of my lyrics. I know this because she has come up to me after several of my performances and expressed how she values my songs and their importance to allergic children. This means a lot to me as I have spent so much time creating these songs so children can learn and become empowered through them. I love hearing that parents appreciate this, but think it’s remarkable that a company CEO does too. That’s the type of company HomeFree is. They are a part of the allergy community, creating products that make life a little easier for those affected by food allergies. To me, they are more than just safe cookies, they are great cookies! They were featured on the Today show last fall as one of 4 recommended back to school snacks, not as allergy friendly cookies but as delicious healthy cookies. If you have not heard of their superhero contest, I urge you to check it out at: bit.ly/AllergyContest. I am happy to announce that I will be writing a special song for the winners of the contest!